Once you’ve scheduled a refinishing service, you’re probably eager to imagine what your space will look like when it’s done. No more dirty, dingy looking bathtub, discolored tiles, or stained sink. To ensure the process goes efficiently when your contractor arrives, there are a few things you can do beforehand to prepare. Whether you’re having your bathtub, shower, sink, tiles, or kitchen countertops resurfaced, we have a few tips for you. Keep reading to see how you can make the process go as smooth as possible! Clean thoroughly. 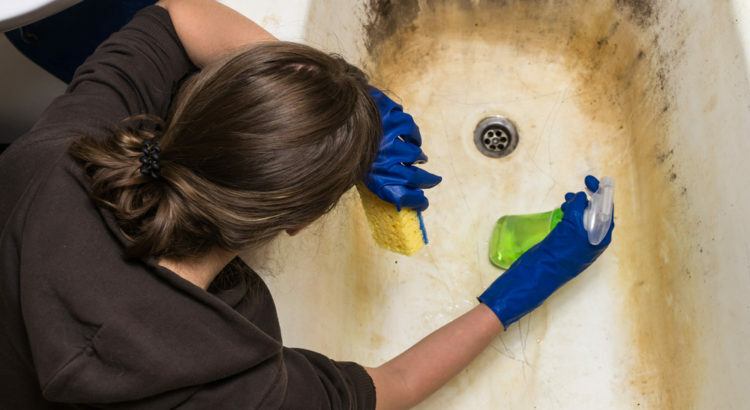 Use a disinfectant spray and washcloth to scrub away any loose residue or debris. Remove personal items from all surfaces- Shampoo and conditioner bottles, soap, razors, toothbrushes, hair products, decorations, etc. Take out all items you will need for that day, as you will have limited/no access. If any fixtures, such as faucets or drains, are being removed or replaced in addition to the refinishing, this should take place before we begin. Clean thoroughly. Sweep, vacuum, mop, scrub- Whatever it takes to remove any loose debris. Damaged tiles should be repaired before refinishing. Make sure the grout is in good condition, we can take care of small issues. Remove decorations, trash cans, standing toilet paper rolls, etc., from out in the open and on walls. Remove any other personal items that may be in the way or that you will need for the day. Clean with a degreaser to remove any remaining grease or residue. Remove all food, appliances, and decorations from countertops and walls. If your refrigerator is adjacent to countertops, it will need to be pulled out. If the pilot light is always on your stove, turn off gas. Take out any items from the kitchen you will need for the day. To learn more about how you can prep for your refinishing service, or to schedule a service, contact us today! We’ll come to your home in New Jersey, Boston, or Columbus. Check out our service areas here!